For some summer wedding dresses, you want to find just the right bridal gown that will make you feel beautiful and extraordinary on your special day. There are three components of a wedding gown that make it right or wrong for summer. For summer wedding dresses, first and foremost you must choose a fabric or combination of fabrics that lets your skin breathe on your wedding day. Even if you don't mind the feel of a heavier fabric, pay attention to how it looks. You want a fabric that carries a light and airy look, something that swirls as easily as a summer breeze. Pass on the Duchess satin and brocades unless you want to change your date to late fall or winter! Chiffon is most often a sheer or almost sheer silk fabric. It drapes gracefully over the body, and it works well in layers on its own or as an overlay on another fabric. Look for a burnout design, which creates a beautiful translucent textured effect on the light fabric. Charmeuse is a newer fabric with a soft, satiny feel to it. It's lightweight but with enough body to hold a luster that lights up your natural beauty. Georgette is another silk fabric with a gorgeous drape to it, thin enough for the hottest summer day. Organza must overlay other fabrics because it is so delicately transparent. It is another material that designers can put through the burnout process. Its soft, light touch reminds people of the soft petals of a flower. Crepe has that thin yet slinky feel to it. You've got to love the texture of the slight crinkle it carries from the interweaving of the threads when it's created. Crepe de chine is the thinnest crepe. Dupioni satin is a lightweight satin yet with an unevenness to the weave that, like crepe, gives it a texture so interesting you just want to reach out and caress it. Cotton sateen has the breathability of cotton with the sheen of satin. Your trims will work best made from tulle, eyelet, or lace. Allow the fall brides to use the satin ribbons and the other heavy trimmings. Some people will tell you to look at both the sleeves and the neckline when you are looking for summer wedding dresses. But the truth is that most women already know before they ever open a bridal catalog how much of their bosom they're willing to expose. And the days are gone when brides wore high-necked gowns for a demure look. Do be certain, however, if you're choosing a low neckline, that it is fitted correctly to your shape. Sleeves are another matter. You will have a wide selection for your summer wedding dresses. Delicate cap sleeves just cover the points of your shoulders. Short sleeves on a wedding gown come down over just the top inch or two of your upper arm. 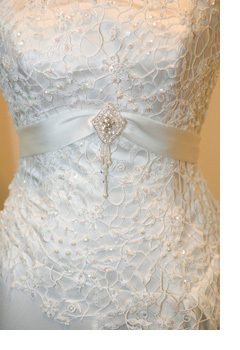 Many bridal gowns are strapless, and some have slender spaghetti-style straps. This type of gown offers you three choices: You can wear the gown as is. You can buy or have made a bolero-style jacket to cover your shoulder; even an organza or chiffon stole will serve to keep your shoulders warm in the cooler evening hours. We love the third option, because it provides so much flexibility. What if you fall in love with a strapless gown but you want sleeves? Today's miracle technology allows you to purchase sleeves separately from your gown! Whether you want something long and sheer -because it's summer- to retain your modesty, or if you just love the look of a tulle sleeve flocked with a floral design and embellished with pearls, you can truly make your summer wedding dresses your own. For your summer wedding dresses you've got to choose from the right palette of colors, and they come from selecting the right flowers for the season. Roses bloom in June, and the sincerity of a deep, red rose is hard to beat. But you can also find roses in delicate peach and yellow shades. White calla lilies bestow simple elegance. Many flowers carry shades of lilac and light purple. Leave heavy cranberry shades, purples, and deep blues for the autumn and winter brides. Choose the colors for your bridesmaids and your own trim (if any) based on the flowers you think you'd like. Look for two colors that are opposite from one another on the wheel. Or you can choose three colors that are equal distances from one another. If you want to create a cool look for your special day, stick with lighter, fewer colors for your summer wedding dresses. There's a website called ColorSchemeDesigner.com that will help you decide. And don't forget, you can carry out your color theme, not only on your bridesmaids but also on your stationery and reception linens.